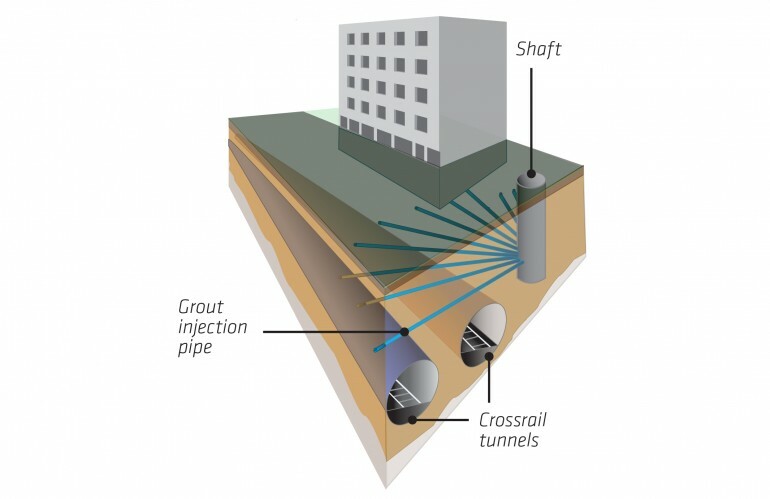 Ground settlement - managing the effects of tunnelling - Crossrail . For information about the Elizabeth line please visit the Transport for London website. Settlement is the technical term given to the way the ground moves around a hole after it has been dug out. Digging tunnels, shafts and basements always causes small movements in the ground. This is true of Crossrail’s tunnelling works and significant effort was made to limit the effects of this movement on buildings that sit above our tunnels. Our work was conducted to create as little settlement as possible. We did this firstly by controlling the way that we carried out the tunnelling and then, where necessary, by treating the ground so that it was less likely to move. One effective way of treating the ground is by using ‘compensation grouting’. During construction extensive use was made of compensation grouting, a well-established technique employed on tunnelling projects around the world to minimise settlement. It works by injecting a cement-like substance, called grout, into the ground to firm up the area where settlement is expected to occur. Find out more about Crossrail’s grouting programme. Even with these measures, some level of settlement was inevitable although the amount of settlement on the Crossrail project has generally been lower than anticipated. Our approach to dealing with buildings affected by settlement is set out in Crossrail Information Paper D12 – Settlement. This includes a commitment to repair damage caused by our tunnelling works. In line with this policy we surveyed thousands of properties near our tunnels before tunnelling started. These surveys are known as pre-construction surveys and allowed us to record existing defects. Now that ground movement resulting from our tunnelling works has stopped we are in a position to conduct follow up (post-construction) surveys if required and to understand whether we need to repair damage our works have caused. If your property had a pre-construction survey and you believe that damage has since occurred as a result of our works you may be entitled to a post-construction survey in line with our settlement policy. You should contact our helpdesk on 0345 602 3813 or helpdesk@crossrail.co.uk. If your property was not subject to a pre-construction survey, or you don’t know whether a pre-construction survey was conducted, but you believe that our works have caused damage, please also contact the helpdesk. Such claims are likely to be dealt with in line our standard damage claims procedure.